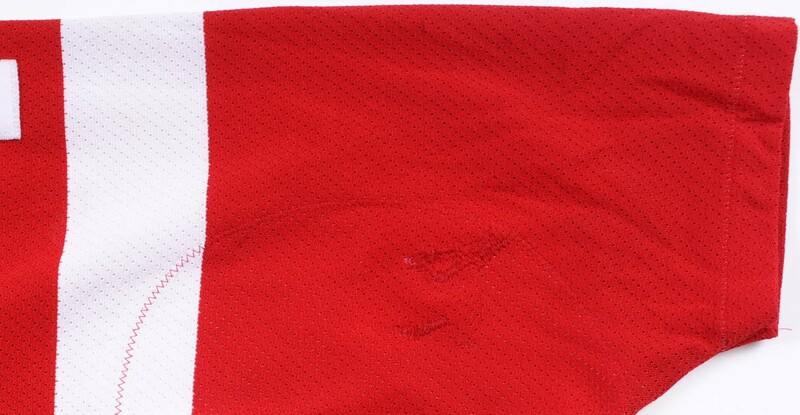 This road red air-knit gamer by CCM and Eastside was worn by Paul Coffey during the 1992-93 NHL season. The Edmonton Oilers selected Coffey with the 6th pick in the 1980 NHL Entry Draft. 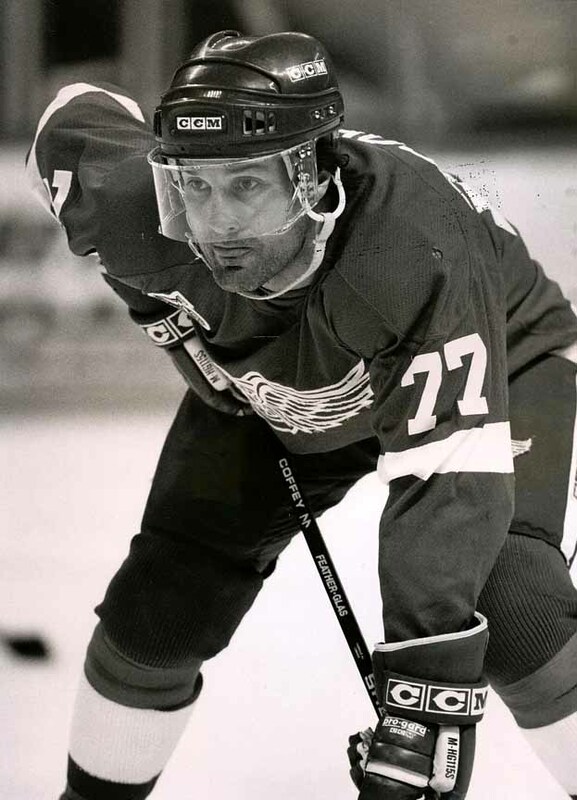 He broke camp with the club in 1980 and never looked back, eventually becoming the 2nd highest scoring defenseman in league history. Coffey spent his formative years, 7 seasons in all with the Oilers as this group of talented youngsters turned into a dynasty. During his time in Edmonton, Coffey celebrated the franchise’s first 3 Stanley Cups in ‘84, ‘85 and ‘87. On November 24th 1987, Coffey was dealt to the Pittsburgh Penguins where he would team with Mario Lemiuex for the next 5 years, while helping their franchise to their first Stanley Cup title in 1991. Paul spent the last decade of his career with a number of clubs. He was reunited with Gretzky and Kurri in Los Angeles in the early 1990’s. 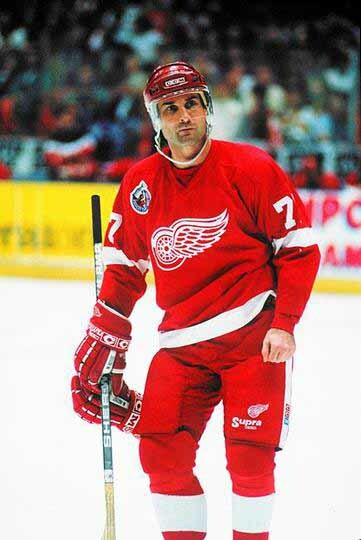 He eventually helped two of his new clubs, Detroit and Philadelphia, to Stanley Cup Finals appearances in the mid 1990’s. Coffey ended his illustrious career second to only Ray Bourque in all-time goals 396, assists 1135 and points 1531 scored by a defenseman. These incredible totals rank him 5th on the all-time assist list and 12th on the all-time points list. Coffey’s playoff acumen is no less impressive having tallied nearly 200 career playoff points, which places him 5th all-time. Coffey has eight 1st or 2nd team NHL All Star selections to his credit. 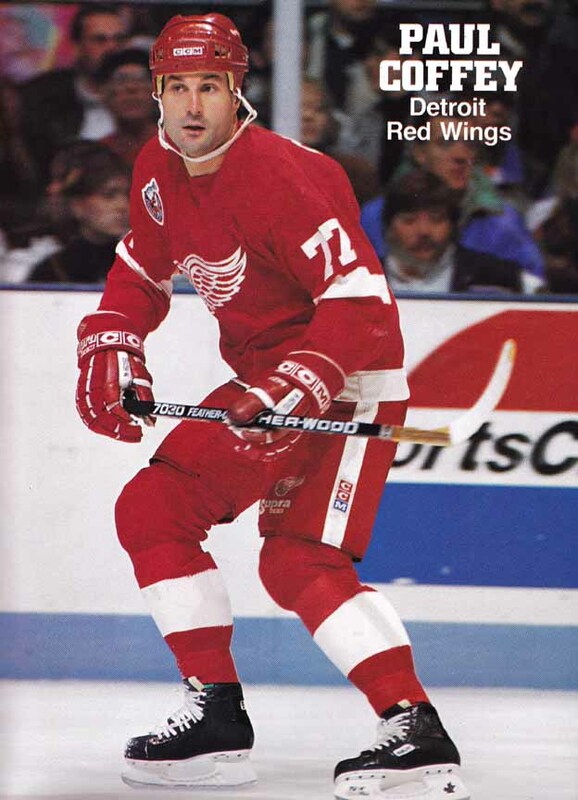 He played in an astounding 14 NHL All Star games. 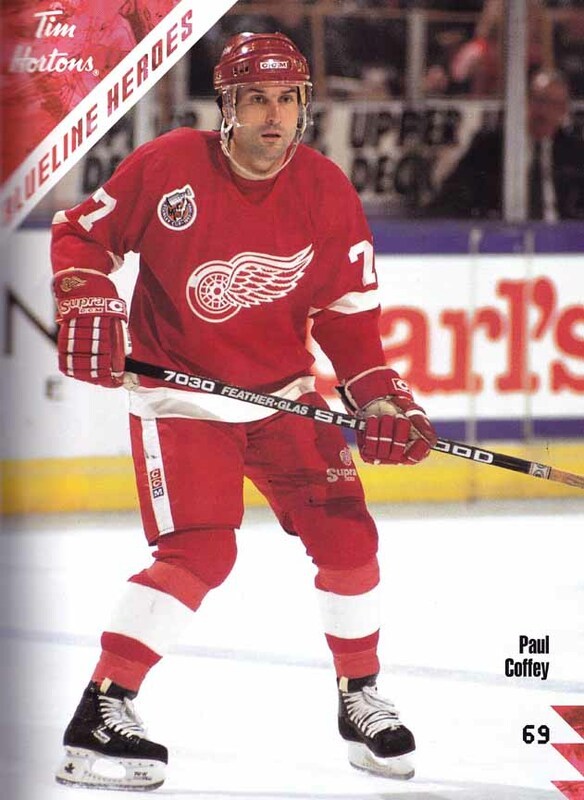 Internationally, Paul represented Team Canada in 3 Canada Cups and the 1996 World Cup of Hockey. 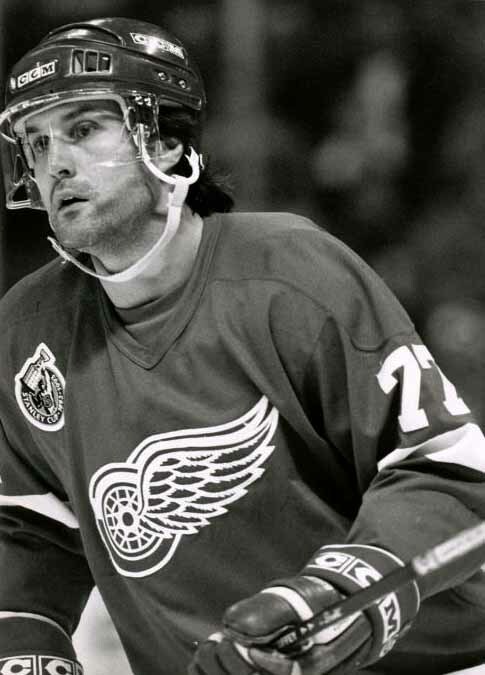 His impressive hardware case includes 3 Norris trophies as leagues best defenseman and 4 Stanley Cup championships. Paul is considered one of the game’s all-time greats and was so recognized in ‘The Hockey News’ book that ranked the 50 greatest players in NHL history. Coffey was honored as the 28th greatest player in NHL history in that publication. The part he played in the Edmonton Oilers dynasty was invaluable, and helped form the deadliest offensive machine ever put on the ice. 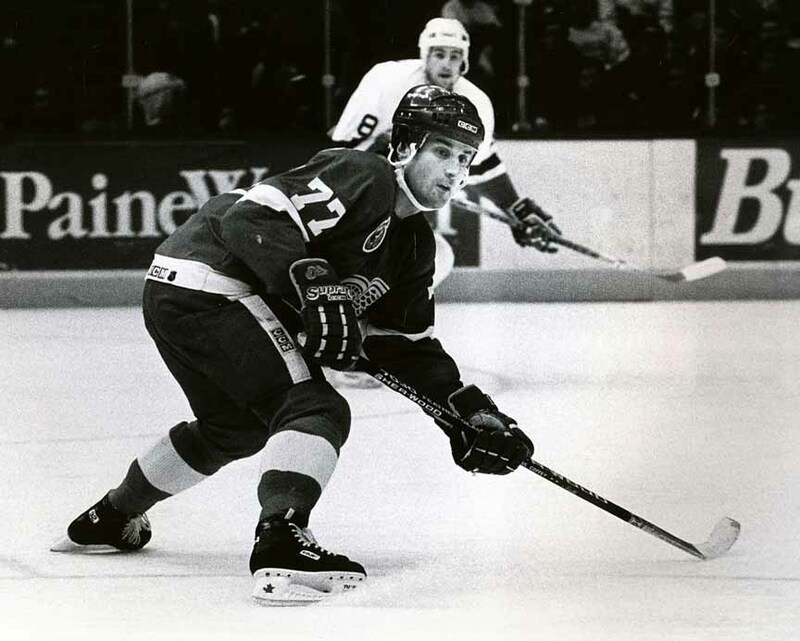 His single season record for a defenseman of 48 goals, recorded in 1985-86 will likely never be topped. Paul was one of the league’s finest skaters and images of him gliding down the ice wearing the Oilers blue and orange won’t soon be forgotten. He is a most deserving Hall of Famer and was one of the finest offensive weapons in NHL history. Sewn to the right breast of this vintage gamer is the NHL’s 100-year Stanley Cup anniversary patch. 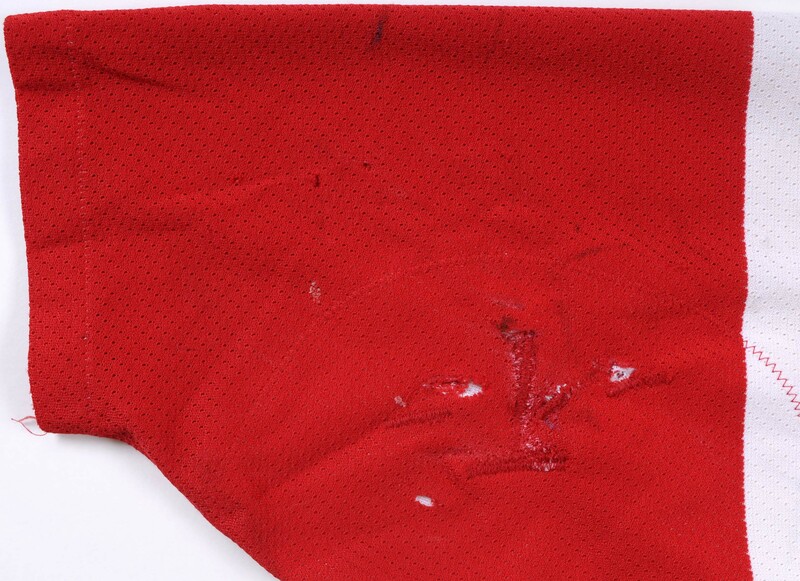 The game wear on this size 48 sweater is solid and consists of stick and slash marks, board burns, un-repaired burn holes, a heavily salted fight strap, fine inner pilling and a couple of handfuls of team-sewn repairs. 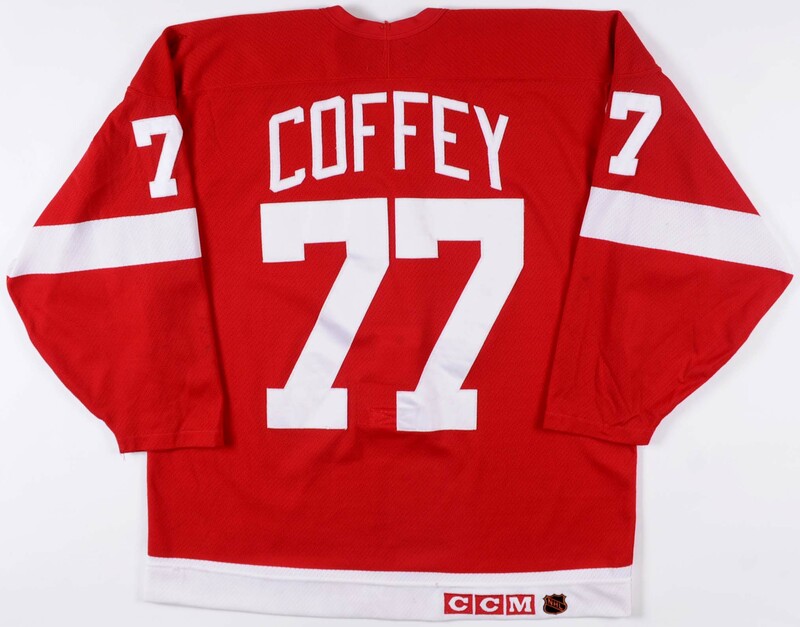 Shown above are a number of beautiful photo matches of Coffey wearing this exact jersey during the 1992-93 season. A tremendous well-worn, heavily photo matched offering from Coffey’s first season in the Motor City, complete with the coveted Stanley Cup anniversary patch, choice!